Automatic PDC - Automatic PDC should now work for all normal use-cases (please report issues). We still need to fix these cases: Multi-out plugins, Multiple generators feeding a single Mixer track, each with different latencies and the wet/dry mix knob on FX slots. These should be resolved in coming betas. Automatic PDC now works with Generators. APDC applies to inter-track routing and side-chains. Manual and Auto-PDC can now co-exist. Manual PDC is applied as an offset to Auto PDC. Manual PDC - Negative values - delay the selected track, positive values - delay all other tracks. There's a new audio input delay control on the INPUT menu to fix latency issues with individual audio inputs. PDC icons now light orange when a track reports latency, not when it's delayed (as before). This will help you to quickly identify PDC inducing plugins. DirectWave - A Zone's loop type will now apply to all selected Zones. Fruity Reeverb - Is now a 64 Bit FL plugin. Help - FL now uses the online version of the help file. You can download an offline version here (although FL 12.9 won't open this by default). Mixer - Increased to 125 Mixer tracks. More will be added later. Patcher - Reduced memory usage. Playlist - Improved visibility of Clip borders in Solid view mode. Time Signature Support - Playlist, Piano roll, Project Settings and Time Markers. Right-click Time-markers and select 'Time signature'. Shift+Alt+T to set time-signatures over a selected time-range. Use the on Pattern Clip Menu 'Use current time signature' to set a time-signature based on Playlist position. Sampler Channels - Legacy precomputed effects are back. New: Playback - 'Start offset' (automatable), will get a position visualization in the next update. Precomputed - 'Sample start', and 'Length' effects. Tap tempo - Sync option for tempo tap is now off by default. Unicode Text - Most FL plugins now support unicode characters when exchanging filenames and other text with FL Studio. ZGE Visualizer - Layers can be collapsed. Buffered layers are more obvious now. New 'SplinePeaks' effect. WHAT ABOUT THE LATEST OFFICIAL RELEASE VERSION? 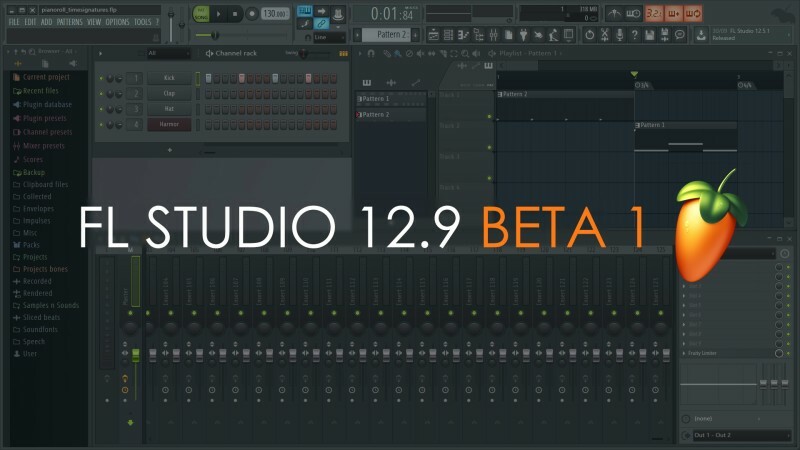 If you missed the last official FL Studio 12..5.1 release, see what's new here.